I'm a bag lover, no doubt about it. Ive had my fair share of school bags and ‘manbags’ - but obviously my life has been pretty much ruled by camera bags. So when it came to needing a bag for camp trips I was pretty excited to NOT be buying a camera bag. When I was in school most people had sports backpacks or record bags but a small number of cool kids had Jansport bags and Eastpak bags. I’ve no idea what made them so cool, perhaps the low slung, slightly grimey, skateboardery thing they had going for them. Either way, I wanted one and never did manage to persuade my mum to buying one (I ended up with a Berghaus day sack FYI). Roll on 15 years and I’m on Amazon looking for a backpack. Something I can cram loads of stuff in, clothes, travel electrics, maybe a laptop and what if I could pack my drone in there? That would be super easy for just quick runs out on my bike filming? 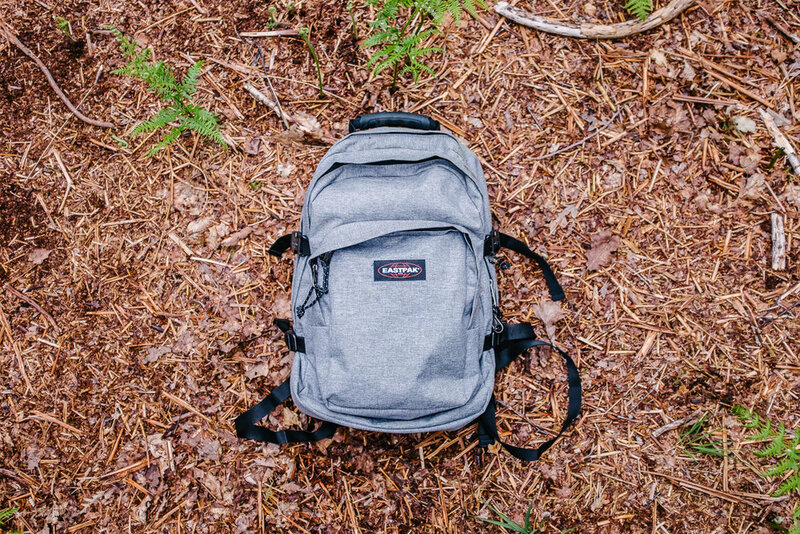 A day later and the Eastpak Provider arrived on my doorstep. It was a little more than I wanted to spend (its actually come down in price as well recently) but I figured I was going to spend nearly £200 on a drone backpack so this would be a cheaper alternative. For our first test, I took it out on a small hike with the kids to build dens. The Provider has 3 compartments, A large main compartment, a shallower secondary compartment and a smaller pocket compartment on the front with extra netting and accessory holders inside too. The large compartment also has a laptop compartment, which I’ve managed to get my archaic old Dell XPS 16.5” into, no problems. It runs down the back of the pack. I left it empty for this trip though. Clothes, coats went into the main compartment. This section also has 4 compression straps, two with clips, two with buckles meaning that you can compress it right down to super thin. I can’t get over how great those straps are, it made the pack much more compact and managable. The secondary compartment is outside of the straps, so harder items such as water bottles went in here, packed lunch too. Finally the front pocket housed my Fuji x100s, batteries, knife, phone, wallet, keys and a Google Nexus 7 tablet too with space to spare. PS. None of these gear posts are sponsored.